Construction has long been a male-dominated industry—but a big shift is underway. Courtesy Miron Construction. The history of construction—to the best of anyone’s knowledge—goes back to the Stone Age, when stones essentially served as proto-hammers. Hard stones were used to break softer stones, blacksmithing surfaced, metal nails appeared, and stuff got built. Roughly two million years later, the hammer handle was invented, followed by forging, ironwork, and the Industrial Revolution, thus giving birth to construction as we know it—which has largely remained a male-dominated industry. While construction still evokes images of sweaty men in hard hats, the notion that the industry is—and will always be—a boys’ club is fading fast. A significant disparity in the ratio of men to women in construction persists, but a big shift is underway. 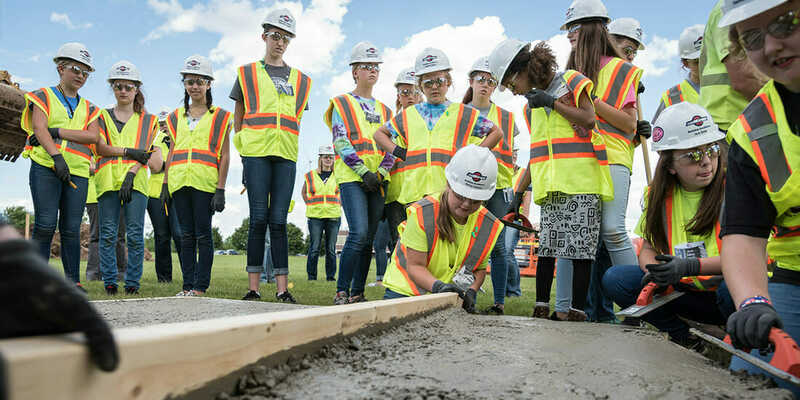 Miron’s Build Like a Girl program encourages young women to learn about construction trades through hands-on projects at temporary job sites. Courtesy Miron Construction. Founded in 1918 and coming up on its 100th anniversary, Wisconsin-based Miron Construction is at the forefront of this sea change. By encouraging a younger generation of workers, specifically women, to get involved in construction, Miron is helping to bridge the industry’s skilled and technical labor shortage—and is committing to tech innovations that will help ensure its diverse future. When Miron first recognized that it had exhausted its typical recruiting efforts, it wanted to do something that would draw more women into the field. Currently, approximately 9 percent of construction jobs are held by women, the majority of which are office positions. (Women hold only 1.2 percent of construction trade jobs.) To address this gap, Miron launched an annual outreach event called Build Like a Girl to show middle- and high-school girls that construction is not just for boys. 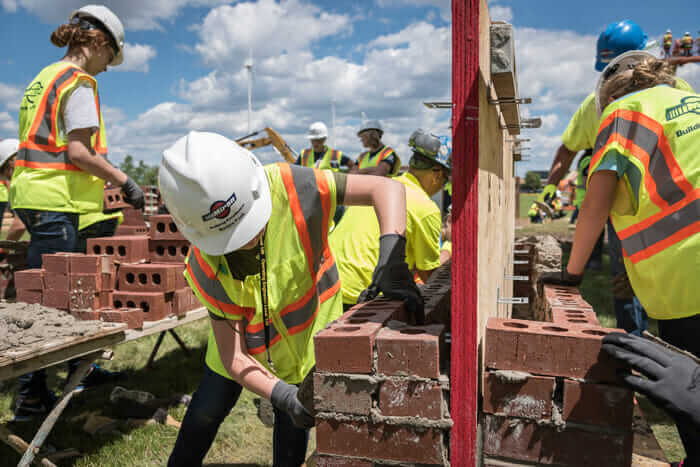 Build Like a Girl encourages young women to roll up their sleeves and experience what construction and the trades are all about, through hands-on projects at temporary job sites. Additionally, Miron partnered with Miller Electric and the Talent Collaborative of the Fox Cities in fall 2017 to host Smart Girls Rock!—an event that introduces female high-school students to STEM-related careers. 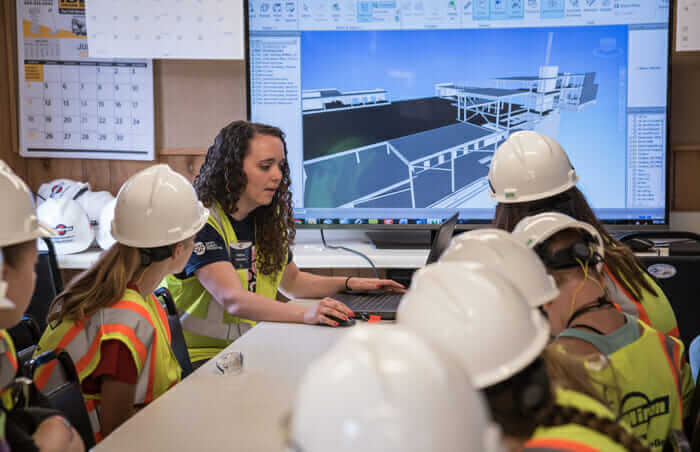 Considering the construction industry’s shift from analog to digital, the partners saw it as an opportune time to expose young women to construction as a STEM-based career choice. Melissa Schulteis, a virtual-construction specialist at Miron, demonstrates construction technology for Build Like a Girl participants. Courtesy Miron Construction. According to Tonya Dittman, LEED green associate at Miron, the company was interested in hiring more diverse recruits. Miron wanted to invite the other half of the population—women—to get involved in construction. 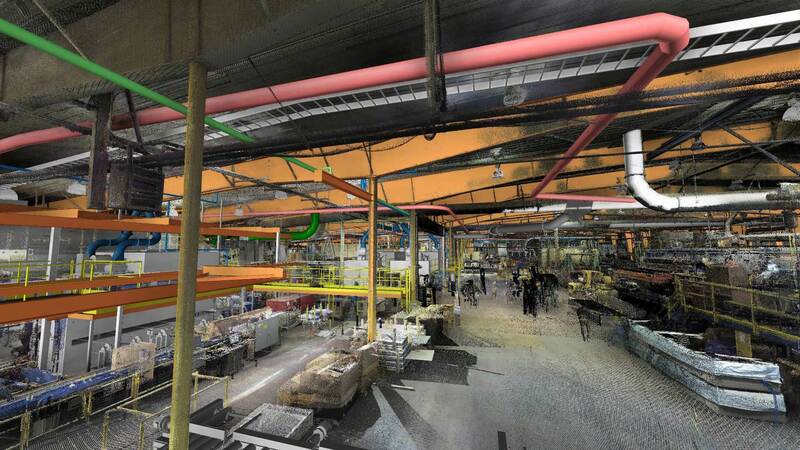 VPI combines 3D virtual building systems, equipment models, laser scanning, and laser-alignment technologies to allow the entire construction team—from subcontractors to engineers and business owners—to collaborate in real time. Courtesy Miron Construction. New technology is certainly a carrot to attract younger generations—regardless of gender—into construction. At Miron, it also benefits the bottom line. To streamline the construction process and help alleviate problems such as cost overruns and equipment malfunctions due to miscalculated installations, the company developed a methodology called Virtual Process Integration, or VPI. VPI combines 3D virtual building, systems, equipment models, laser scanning, and laser-alignment technologies. Through VPI, the entire construction team—from subcontractors to engineers and business owners—can collaborate on one project in real time. This gives businesses a big-picture snapshot of the nuts and bolts of their projects, and it all happens before breaking ground. As a result, Miron can prevent downtime and lost revenue for its clients. See how Miron used collaboration technology to reduce rebuild costs. VPI proves invaluable for clients with massive, complex machines, such as those in the pulp-and-paper industry. Those machines need to be built and integrated quickly and efficiently to prevent a production slowdown. For example, one client’s factory produces 1,800 units per minute, which means minimizing downtime for replacing machinery is crucial. For another client, Miron spent around eight months to prepare for a six-day installation. The preparation paid off; the company had saleable product within a few hours of project completion. That means everything has to be installed perfectly and on time. “If you miss that deadline because things don’t fit right or installers aren’t going in the right order, the cost of our work is minimal compared to that equipment not producing product,” Dittmann says. The Ci Lab interactive workspace lets teams collaborate on various platforms using a giant wall-mounted screen. Courtesy Miron Construction. Another big and tech-flashy draw for the incoming workforce of young women and men is Miron’s Construction Innovation (Ci) Lab. 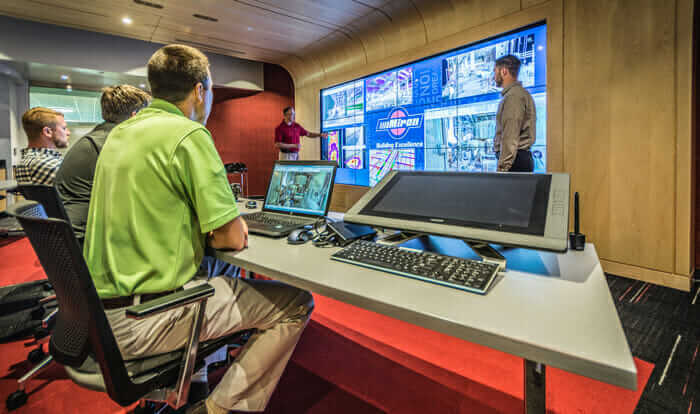 The Ci Lab is an interactive workspace that allows anyone on a construction project team to collaborate on various platforms using a giant, wall-mounted, iPad-type screen. Miron taps into both technology and role models to inspire the next generation of construction professionals. Courtesy Miron Construction. Construction is rapidly evolving through technology: It’s an industry that’s become a lot more than nuts, bolts, hammers, and scaffolding. By bringing awareness of the industry’s diverse opportunities to girls through community involvement and education, Miron Construction is doing its part to show young women that they, too, can be a part of something innovative and rewarding. They can work in virtual construction and apply the VPI process in an office setting, or they can roll up their sleeves and get dirty on job sites (while reviewing 3D models on mobile devices in the field). The possibilities within the industry have become virtually limitless for women in construction. Sure, you can still put on a hard hat and dig up dirt, but there’s a new fourth dimension that’s just waiting to be explored by the construction industry’s next generation of young professionals.